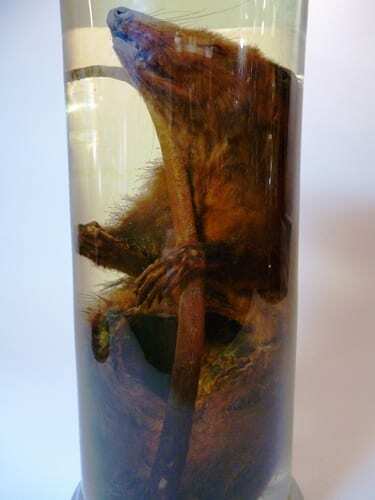 Preserved opossum, with battery removed. Could not distinguish fluid type; odour suggests the fluid is not formalin, the fluid was also not registered as alcohol by the fluid density meter. Specimen appears to have a rusty yellow coloured tint and seems to be dyed in some way. 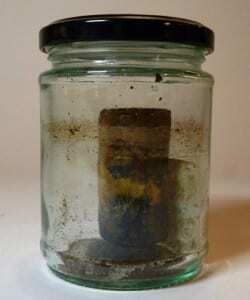 Yellow sediment is present in the fur of the specimen and has also settled at the bottom of the container. Yellow coloured growth from stomach area transpired to be wads of cotton wool (orange tinted) which had been stuffed inside the specimen. On removal, a D-type Duracell battery was removed from the body cavity (organs seem to be removed). 2) So please help us solve this mystery – why was there a D-cell battery inside this preserved opossum? I have two theories: a) it was an experiment into the evolution of the Duracell bunny. b) something terrible and Frankensteiny, only using a much lower voltage (1.5v vs. whatever is in lightning). Suggestions in the comments box please. 3) You may ask why we don’t have any records of this electrical insertion, as obviously it can’t have happened that long ago given that the presence Duracell D-cell batteries gives a maximum age to the specimen’s preparation (if not its original field collection). 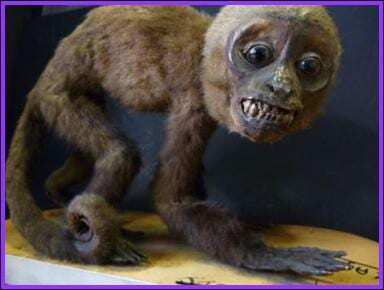 The reason we are so clueless is that this wasn’t always a Grant Museum opossum, or even a UCL opossum. The one thing we do know about it is the small label “5ap”. This specimen number identifies it as one of a huge number of specimens which came to the Grant Museum in the 1980s from Imperial College London when there zoological collection was closed and absorbed by us. Unfortunately the records or catalogues which could have told us more about “5ap” and the rest of the Imperial fluid collection were never located in South Kensington at the time of the transfer, or since. 4) To tell you something more zoological about the specimen, opossums are American marsupials. The more famous marsupials (outside of the Americas, at least) live in Australia and New Guinea, but they only account for about two thirds of marsupial species. The rest live in Central and South America, with one species – the Virginia opossum – having wandered into North America. Marsupials are mammals which give birth after a short gestation to highly under-developed young, which then undertake a long period of development by suckling on a teat (often in a pouch, but not always). By contrast the more common (and if you ask me, less interesting) way of being a mammal involves a long period of development in the womb, followed by a relatively short period on the teat, like in humans. *The Grant Museum does not endorse the insertion of batteries, or any other objects, into opossums. They were preserving him with sodium chloride. So it’s a cut and dry case of a salt and battery. 5ap could refer to the latest release from Apple Computers of the new iPossum? the answer may be simpler than you’d think. After removing the guts and stuffing the opossum, perhaps it didnt float right in the jar, or floated to the top or off kilter, so the person preserving the specimen had to quickly come up with something heavy that they could fit in the opossum, that wouldnt float, and wouldnt be heavy enough to tear through or distort the body. the only thing available at the time? an old d-cell battery. it makes sense given that if the specimen was prepared fresh on sight, maybe a d cell battery from a flashlight was the only thing in the building they could use. I work with a living, non battery powered opossum at a nature center, and she is getting old, around 4 years old. 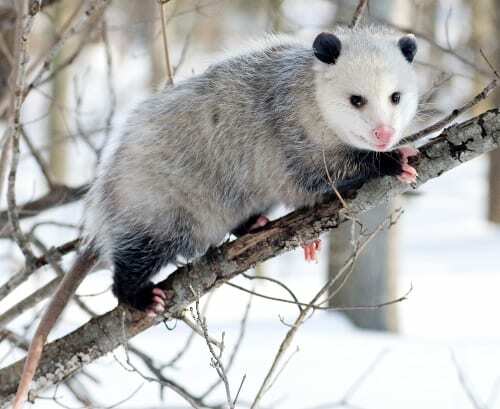 opossums, like most marsupials, dont live as long as other animals their size. the genes for slowing down biological senescence arent there because opossums generally die long before they reach old age. sad quirk of evolution, but on some islands on the east coast that have not had the natural predators, and they have evolved to reach a maximum lifespan of 6 years old. anyway, when our dear Jasmine ends up “not just playing possum” we will have her preserved or stuffed, so she can still be used for education after her death. hopefully they will have something better on hand than a battery. Weight to keep it from floating. Two words man made pikachus… That’s three words. I expected to learn about why maybe someone would remove the organs before preservation there. I didn’t really… neat vid though. My second theory is this; it was taken from some other place, where indeed they did something Frankensteiny. Maybe a bit more benign though – muscle reflex experiments, and that’s all. When the specimen ceased being useful (decomposed too much) or when the experiment failed, they gave it to the preservation guys, and they just didn’t care.